Kurkure, Cheetos, Nik Naks corn curls have been a popular American snack food since the 1950s. These crispy cheese snacks are formed from corn meal, water, oil and flavored coatings. Cheese curls are an extruded snack, meaning they are cooked, pressurized, and pushed out of a die that forms the particular snack shape. They are then baked (or fried, depending on the product) and flavored with oil and seasonings. Today, we eat extruded corn snacks that are ball-shaped, curly, straight, or irregularly shaped depending on the shape of the die. Flavorings added after baking or frying varies greatly and different brands have distinctive flavors. Jinan Dingrun Machinery Co,.Ltd is a professional extrusion machinery manufacturer. With our many years' research and study, extrusion techniques have been widely used in many fields. As a professional extruder machine manufacturer, Jinan Dingrun Machinery Co,.Ltd has exported the food machines to more than 60 countries and regions, such as South Africa, India, Malaysia, Indonesia, Brazil and so on. Some of customers become our agents in their area. We hope to have long friendly business relationship with more customers from all over the world in the future. 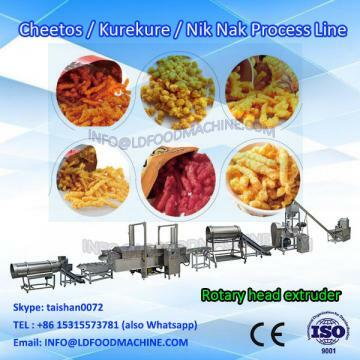 As a professional extruder machine manufacturer, we are responsible for the nature damage of the machinery in one year except for man-made damage. All spare parts and wearing parts are attached with the machinery for free; and these parts should be enough for one year use.